D/F Machine Specialties will attend FABTECH 2016 in Las Vegas, November 16 to 18. D/F will showcase several new heavy-duty MIG and TIG welding products, as well as the latest products for improving welding in the fabrication and manufacturing industries. D/F can be located in Booth N4624. High Capacity NCM18/HTM18 "BIG MIG" Machine Barrel – The new high capacity "BIG MIG" has the same features as the original NCM15/HTM15 BIG MIG, but with a larger front end (1.570" ID) for increased gas coverage, high current density, aluminum welding, and large diameter wire. Direct Mount Gasless Hardfacing Machine Torch – The new water-cooled Direct Mount Overlay torch is recommended for mechanized applications where production demands the maximum durability and quality for multi-surfacing and rebuilding applications. Semi-Automatic Curved MIG Guns – The Semi-Automatic Curved MIG Guns are rugged, all purpose, water-cooled, manual MIG welding torches designed to operate at welding currents up to 500 amps on a true continuous duty cycle using all types of shielding gases. D/F Machine Specialties to Attend Fabtech 2013 - Showing New MIG & TIG Welding Products in Chicago, IL. D/F Machine Specialties will showcase several new heavy-duty MIG and TIG welding products at the 2013 FABTECH International/AWS Welding Show at McCormick Place in Chicago, IL, November 18-21. D/F will have on-hand its NEW versatile Robotic/Automatic Water-Cooled 600 amp Straight or Curved interchangeable Machine Barrel, its NEW Water-Cooled 750 amp Gasless Overlay Cladding Machine Barrels, its NEW versatile Robotic/Automatic Water-Cooled-to-the-Tip 750/850 amp Machine Barrel, its NEW Twin Wire Water-Cooled 1200 amp High Current Machine Barrel, and its NEW Remote/Direct Mounted 600 Amp Water-Cooled-to-the-Tip TIG Machine Barrel. 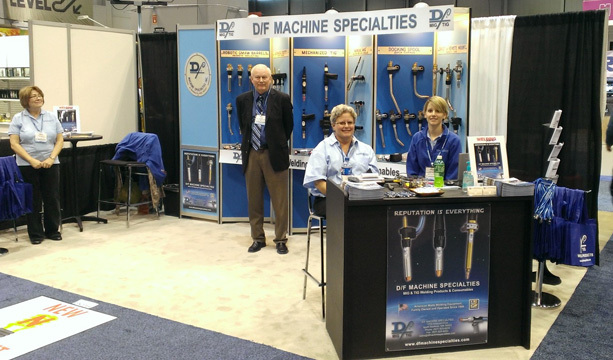 D/F Machine Specialties Booth at Fabtech 2012 - Showing new MIG & TIG welding products in Las Vegas, NV. D/F Machine Specialties showcased several new heavy-duty MIG and TIG welding products at the 2012 FABTECH International/AWS Welding Show at the Las Vegas Convention Center in Las Vegas, NV, November 12-14. D/F had on-hand its NEW versatile Robotic/Automatic Water-Cooled 600 amp Straight or Curved interchangeable Machine Barrel, its NEW Water-Cooled 750 amp Gasless Overlay Cladding Machine Barrels, its NEW versatile Robotic/Automatic Water-Cooled-to-the-Tip 750/850 amp Machine Barrel, its NEW Twin Wire Water-Cooled 1200 amp High Current Machine Barrel, and its NEW Remote/Direct Mounted 600 Amp Water-Cooled-to-the-Tip TIG Machine Barrel. Join D/F Machine Specialties at FABTECH, North America's largest event for metal forming, fabricating, finishing and welding in Chicago, November 14-17, 2011. 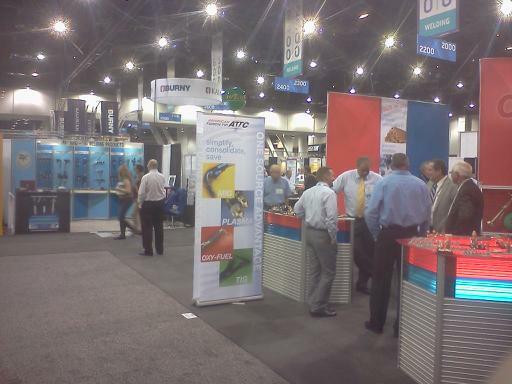 See us in booth #6466. D/F will be showcasing several new heavy-duty automatic and robotic MIG & TIG welding products! Please stop by to see the NEW Tandem-Wire Water-Cooled 1200 Amp Barrel, the NEW Automatic & Robotic Water-Cooled-to-the-Tip 750 Amp Barrels, and the NEW Water-Cooled Gasless Overlay 750 Amp Barrel. 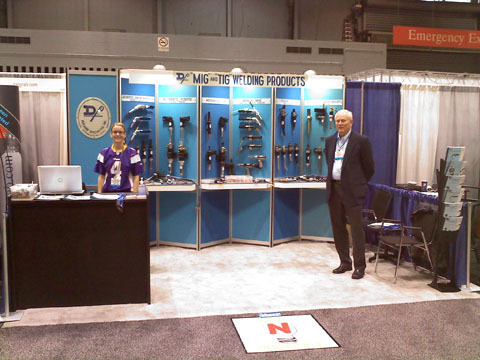 D/F Machine Specialties Booth at Fabtech 2009 - President Del Moerke, Jr. and Inside Sales Representative Laura Christopherson showing new MIG & TIG welding products in Chicago, IL. Laura shows her Minnesota Vikings colors and gives thanks to Green Bay Packers fans for giving us Brett Favre. D/F showcased several new heavy-duty MIG and TIG welding products at the 2009 FABTECH International/AWS Welding Show at McCormick Place in Chicago, IL, November 15-18. Located in booth 32082, D/F had on-hand its NEW versatile Robotic/Automatic Water-Cooled 600 amp Straight or Curved interchangeable Machine Barrel, its NEW Water-Cooled 750 amp Gasless Overlay Cladding Machine Barrels, its NEW versatile Robotic/Automatic Water-Cooled-to-the-Tip 750/850 amp Machine Barrel, its NEW Twin Wire Water-Cooled 1200 amp High Current Machine Barrel, and its NEW Remote/Direct Mounted 600 Amp Water-Cooled-to-the-Tip TIG Machine Barrel.